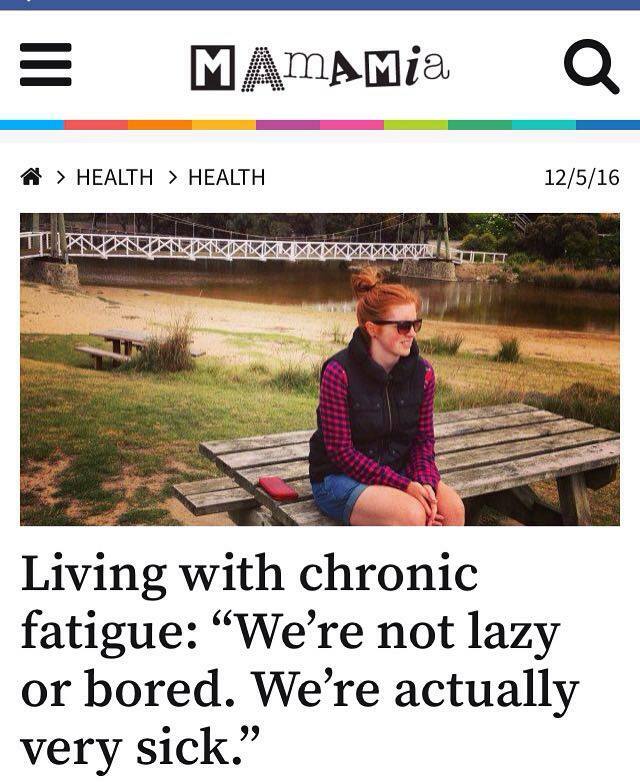 Hello readers, well it’s here again, CFS/ME Awareness Day and I’m absolutely stoked (and struggling to type properly because of my shaking hands) to share that I wrote an awareness raising article for the website Mamamia. Here is the link, please have a read. 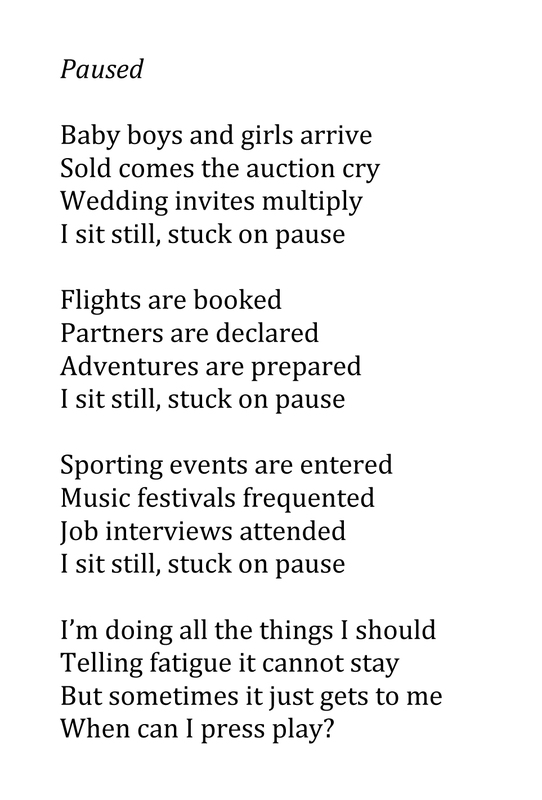 In the mean time I thought I’d share on here two poems that I’ve written in which I have tried to describe CFS and all the feelings it evokes. I normally try to keep things positive on this blog, but that doesn’t mean I don’t have dark days; I certainly do. They are unusual but when they hit it is so hard to deal with. So these poems are from two days when it was all feeling like too much. Writing out my feelings in a creative way almost always makes me feel better in the end, and now I can share these poems with you, knowing my mindset is back on track and that I am in the road to recovery. This entry was tagged anxiety, Blogging, brain fatigue, brain fog, CFIDS, CFS, cfs warrior, CFS/ME, Chronic Fatigue, chronic fatigue syndrome, chronic illness, cognitive dysfunction, exhaustion, Fatigue, health, Hope, illness, improvement, inspiration, invisible illness, ME, mind fog, myalgic encephalomyelitis, poetry, positive thoughts, post-viral fatigue, progress, progression, PVF, PVFS, recovery, SEID, spoonie, spoonielife, Wellness. Bookmark the permalink. I came over from your article on Mamma Mia. Thank you for sharing your experience. My partner has lived with CFS for almost 10 years and I felt every one of your words. Thank you so much for commenting Cathy, best wishes to you and your partner. Writing this blog really helps me manage my mindset for CFS and I love doing it too. Thank you so much for this article! I have been struggling with CFS for ten years now. In that time I have tried and given up university studies 3 times (I wanted to be a writer and do travel/sports journalism) stopped being as active as I used to be (which is hard when you did competitive gymnastics and were studying to also be a personal trainer), I’ve had friends give up on me, family support but also get frustrated with me, a boyfriend cheat on me because i was ‘too boring’, and I have fought back from the brink of very dark suicidal thoughts. Thank you for your weds. I felt as if I wrote them myself. Thank you for giving al of us a voice for CFS and getting the word out. I am glad to know there are others like me and that there are support groups. I he no idea they existed. You have given me hope. Thank you. So utterly true for my 13 year old daughter. Thanks for sharing. Just on a side note, a group of researchers, led by Professor Sonja Marshall-Gradisnik, from Griffith Uni QLD ( https://www.griffith.edu.au/health/national-centre-neuroimmunology-emerging-diseases ) has identified specific markers on white blood cells that has the potential to be used to help screen and diagnose patients with CFS/ME using blood test. I was part of this study until I developed diabetes. Sonja has said once they find out what causes it, they can then work out how to help sufferers get better.